If you ask high school students why they want to go to college, almost inevitably you’ll hear a variation on one of three themes: education, exploration, and employability. Increasingly as college becomes more expensive and the education itself can be had for free, the employability factor takes center stage in the minds of students. But what is the correlation between our studies and our future employment? More specifically, will choosing a particular major have an impact on my employment in a related career field? 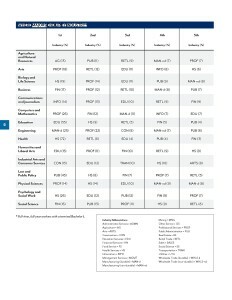 In this chart we get some insight into the career-preparation values of college majors. In the above chart, from the “Select Findings” of “What’s it Worth? The Economic Value of College Majors” by the Georgetown University Center on Education and the Workforce (p. 14) we get a glimpse into the employment sector of full-time, full-year workers with a terminal bachelor’s. The most cursory glance reveals that two types of majors stand out from the rest in terms of the number of graduates working in a related field. Only health graduates and education graduates find themselves employed in directly-related fields a majority of the time (though one could argue that business majors and engineers do too, with their wide applicability across sectors). On the other hand, art graduates don’t work in art-related fields in the vast majority of cases. In fact, they have the highest representation in retail employment. If we explore related charts in the “What it Worth?” full report we find that art-related majors fare no better in general. In chart 40 we discover that art majors also have unduly high levels of part-time employment (studio arts: 29%, music: 29%, linguistics, language, and literature: 30%, visual and performing arts: 35%) and certain of these also find themselves unemployed altogether at abnormally high levels (chart 42). We all must ask what college is for before we plunk down our hard earned dollars to attend one. If the answer has to do with employability we must weigh our perceptions against the realities exhibited by these charts. Those majoring in certain areas will see a huge boost to their ability to find employment, and specific types of employment, while others have a much lower likelihood of seeing any such results in return for their degree. Along these lines this all makes sense if we view certain degrees from the perspective of the end user. After all, if I send my kids to school or show up at a medical clinic it matters very much to me that the teacher or nurse has a certain level of training, and the university provides this training fairly well. On the other hand, never have I demanded to see the educational credentials of an artist before taking in a play, buying a CD, or browsing a gallery exhibit.